I have been to quite a few more DFW area meetups with my Reddit peeps and those are always fun. Our club championships where last weekend and I had fun there as well. 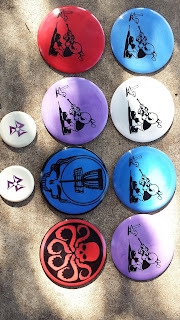 Got a few discs custom dyed by Triple7 customs who has a Facebook page and sells on ebay as well. His work is awesome! he dyed 4 Destroyers and 2 Wraiths for me and I happened to be bidding on another disc that I lost so He did a Roc3 dye for me for a great price as well . 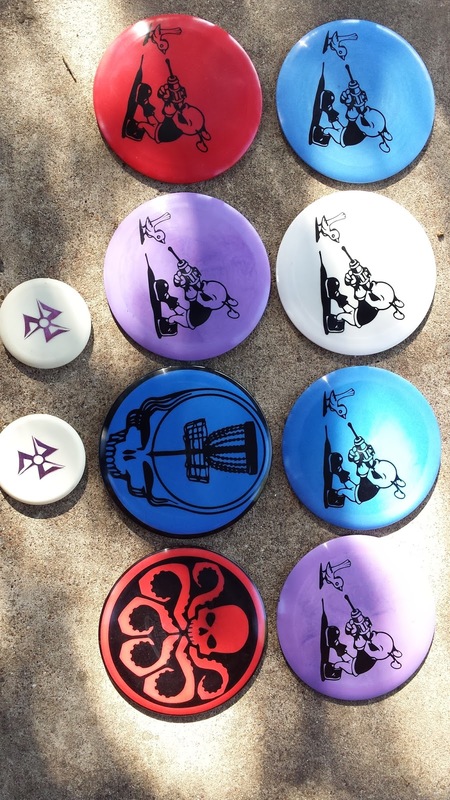 There is also a Custom dyed Valk in there as well. I also recently got a bunch of factory seconds from the Innova store and so far my favorite has to be a 158g Echo * Tern. That thing just sits up straight for me and glides for days. I'm loving it. My shoulder has been holding up OK so far as well. It's still not 100% but I think I have been resting it enough and not playing so much that I have reinjured it or caused the healing process to slow too much. I'm hopefull that by early next year it will be 100% back. Looking forward to the VPO again this year. I'll be volunteering again, but had to hand over the keys to all the baskets at vets to another ADGA member as I am stuck at home during the week to take care of my dad , who had a massive stroke a few months back. That is another story though.